Politics of 2019 is about to get serious in Nigeria's seat of political power, Abuja. Over 400 protesters on Tuesday under the auspices of CAT-BAN Citizens Action, stormed the National Assembly demanding for proper representation from Nigerian lawmakers. 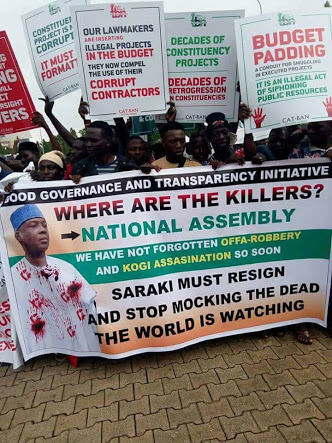 They used strong words on Senate President Bukola Saraki, indicating that they are probably on a mission. The protesters also demanded for the need to format constituency projects to benefit the constituents that it was designed for. Some of their placards read, "Nigerians are not represented in the sharing of the loots via constituency projects". The protesters came in five luxury buses and a truck.